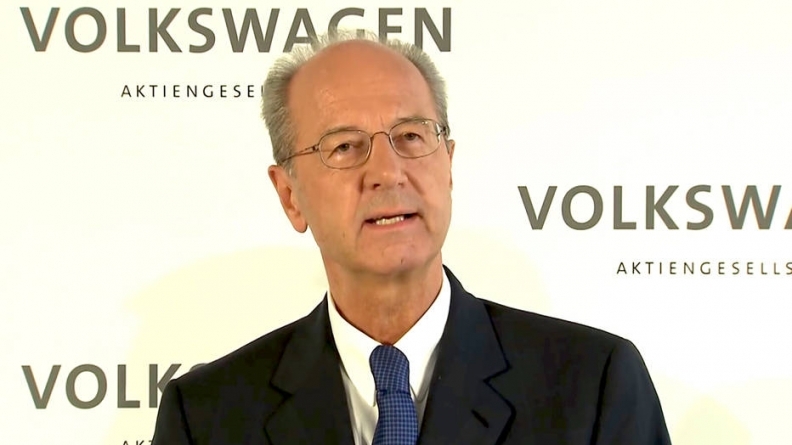 VW Group Chairman Hans Dieter Poetsch's bonus stemming from his previous job as CFO will be reduced. FRANKFURT -- Volkswagen Group Chairman Hans Dieter Poetsch and other top executives will have their 2015 bonus payments cut "significantly," the automaker said today. VW's second-largest shareholder - the German state of Lower Saxony - wants management bonuses to be scrapped altogether while VW's powerful labor leaders have also been pushing for bonuses to be scrapped or lowered as the automaker counts the multi-billion-euro costs of its emissions-rigging scandal. In a statement today, VW said the supervisory board and management agree that the company needs to send a signal on top management pay. Various models are being discussed that would be "appropriate and fair for everyone," the statement said, adding that the move would lead to a "significant reduction of variable pay." The statement gave no figures for the cuts but Reuters reported that the management board has accepted cuts of at least 30 percent in bonus payments. Further measures are being discussed to achieve an additional reduction in variable pay but the cuts may not go far enough to resolve the dispute, sources close to the supervisory board told Reuters. One option may be that VW executives invest in the carmaker, Reuters said, quoting a source familiar with the bonus negotiations. VW's supervisory board will decide on the bonus cuts at its April 22 meeting. The individual compensation components will be published in the company's annual report on April 28, VW said. VW has been under increasing pressure over executive bonuses after labor unions and Lower Saxony opposed generous remuneration because of the need to cushion the financial hit from the scandal. Poetsch was targeted for scrutiny because he was promised a payment of about 10 million euros ($11.4 million) last year as compensation for leaving the higher-paid CFO post. Volkswagen shares rose the most in more than a month, trading up 4.3 percent to 112.05 euros at 10:17 a.m. in Frankfurt today. The stock is down 31 percent since the scandal, shedding more than 16 billion euros from the company's market value. Volkswagen, which is still grappling with fixing 11 million tainted cars, has one of the highest-paid executive ranks in the auto industry. In 2014, its nine-member management board earned a total of nearly 70 million euros, including 54 million euros in variable compensation. That was nearly double the 37 million euros Daimler paid its nine top executives, including bonuses for record earnings last year. BMW's nine management-board members made 35.5 million euros last year. Volkswagen faces billions of euros in costs for rigging emissions tests and has said the 6.7 billion euros set aside in the third quarter last year won't be enough. A VW spokesman declined to comment. VW CEO Matthias Mueller updated management board members at their weekly meeting Tuesday on the plans following a gathering of the company's supervisory board panel on Monday. At a session last week, some executives had opposed the elimination of their bonuses for last year to help stem the financial fallout from VW's diesel-manipulation scandal, according to people familiar with the situation, who asked not to be named because the talks were private.